Art Website Basics – What Every Artist Should Know! Best practices for developing your own effective artist website. Today, an artist must have a well designed website in order to present their art work to prospects, gallery owners and other interested parties. At the minimum, an artist website should provide to the viewer a sample of the artist’s art, an overview of their experience and their contact information. 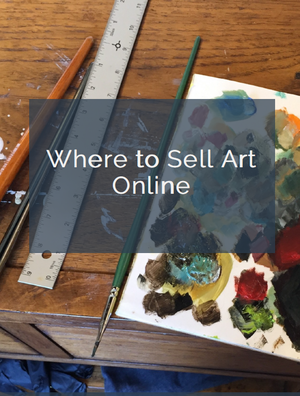 Because of the overwhelming amount of artists who want to be represented by art galleries or who want to sell their art on their own, they must have a website that is easy to navigate and that will load quickly. If a visitor to their website requires too many “clicks” to a slow in loading and difficult to navigate website, the artist will risk losing that visitor. Artist Statement: The artist should have a statement that will explain in a concise manner what their artwork means to them and their reasons for creating their artwork. Always, this information should be presented in plain English and in non-technical artistic terms to the reader. Gallery or Portfolio: This area of the website is the most important section for the viewer. The artist should not overload this section with too much art work, but rather it should have a good representation of their overall work which demonstrates their artistic skills. The images should load quickly and if the artist is selling on their own, pricing should be listed. Representation: The artist should detail any current galleries, individuals and firms who represent them. This section has a two-fold purpose of letting the viewer know where they can see the artist’s work in person, but it also subliminally states to the viewer that there are other professionals who think that their art is worthy. It is a form of a third party endorsement of their art work. Contact Information: Believe it or not, I see artists who omit this information on their websites! At the very least, an artist should provide, street address, telephone number and email address. In addition, fax and any secondary means of contacting the artist. Search engines like addresses! If possible, have the contact and address information in several areas on the website. This will help with the artist’s page rank. Lead Capture: Include a sign up form (or better yet, a popup that offers an incentive for email subscribers) that encourages site visitors to sign up for additional information, newsletter, blog, mailing list, future shows etc. Make it easy for the viewer to do this too, otherwise most people will not make the effort to contact you on their own. Social Media: The artist should provide links to various social media sites that they belong to and communicate through. In addition to providing the viewer with additional means to communicate with the artist, Social Media provides a means for the artist to develop and build their brand. At the very least, the artist should be promoting their art work on Facebook, Twitter, Instagram and Linkedin. Press Releases & News: Any news of interest should be posted and showcased for any viewers to the website. This information can be about a gallery opening, sale of artwork or a donation of artwork to a local charity event. There are many free Press Release sites that artists can use to do this. These PR sites are looking for newsworthy information, not full out promotional pieces. Links of Interest: Links should be industry related (not personal family and friend’s links). Links can include galleries where the artist has shown their art in the past, suppliers, museums and art related websites. When linking to someone, it is wise to always contact them and inform them that you are linking and the artist should always ask for a reciprocal link back to the artist website. Websites also get ranked based on the amount and the quality of backlinks. Blog/Newsletter: If the artist has a blog or newsletter that is industry related (and the artist should have this to help drive traffic to their website) this should be included with any reprints or at least links to these publications. Overall, these are the most important sections that an artist should have for their art website. If their current website does not have the capacity to allow the artist to have this information, then they should find a website hosting firm that can provide this. Speaking of web hosting, the artist should have a URL named after themselves. This makes it easy for any prospects, art galleries and any interested parties to find the artist on the internet. If the artist’s website is with a package hosting/website company, then they should spend the extra money to register their name separately for their URL name too. One other critical component that an artist should have is Google Analytics. This is a free service that you can have a with a free Google account. Google Analytics will show the artist exactly where their website traffic is coming from (search, links & direct traffic), how many visitors are new vs. how many are returning, what keywords are being used to find the website, what page they were on when they entered the website, how much time they spent on the site and provide to the website owner with an overall analysis of who their viewers are. Google explains in simple terms how a website owner can use this information to their advantage and how to fine tune their website and presentation for more traffic. Remember, this is free information that is provided by Google. Besides the quality of their art, an artist website is one of the most important elements that an artist can have when it comes to showcasing, promoting and presenting their art. The website should be designed well for the viewer to evaluate the artist’s artwork and conversely, it should be designed for the artist to be able to evaluate who and why they are interested in the artist’s work. John Math is the owner of LightSpaceTime online art gallery, which holds monthly themed art competitions. I’m doing much of what you’ve suggested here although I sometimes wonder about the effectiveness of my site design. It’s fairly basic and home-made. One thing I’m curious about is what systems others use to display artwork to their websites. My solution has been to use Flickr to host my paintings and then embed Flickr slideshows as a viewer on my site’s gallery page. I move paintings around from “Available” to “Sold” sets as needed, and they then automatically appear in the appropriate viewer. What do others out there do? Any advice or feedback appreciated. Good thoughts, I’m doing most of them. Except the Google Analytics–my host has its own statistical software, not sure why I would need to add another? Marie, I looked at your site and like your work. However, it loads slowly because of the way you’re using Flickr. I just have my pictures embedded in my website–had to learn some HTML, but it wasn’t too bad. And using any kind of Flash can be hard for some viewers–for instance people on IPads or mobile devices. I think the best advice is to use what works for you. If your current host gives you useful info, that should work fine. This is very helpful. Thank you. Nuts & Bolts information to help artists market themselves is always appreciated. I just took a look at your web site and think you have some great art. I didn’t find that the images took a long time to load but I found the dark green background color overwhelmed the artwork and your lovely colors. Also everything I have read about web site design says that you should never have white text on a dark background. I agree 100% with you about having a new website, my site is about 6-7 years old. I realize though speaking to Renee Phillips of Manhattan Arts International, the New artists Success Program, the reading of your articles, with my own desire to have a better product in marketing that I must have a website that will serve me and my clients better. So, thank you for your sound advice in your articles, these articles just reaffirm the information I’ve been receiving from Renee Phillips. My decisions to up-grade my whole marketing plan has been exciting, as well as quite exhausting, especially for someone who is not that savvy on computers. Susanne, Thanks for your feedback. I like your site design – very nice and clean. What an impressive range of works and media you have! I went with dark green background because I felt the colours of my paintings pop nicely on darker walls. I’m not concerned about the colour, although I would like to get better text appearance, perhaps improved font and formatting. BJ, thanks for pointing out the needs of phone/iPad users. I hadn’t thought of that. Maybe I’ll at least add a “mobile” link that will feed users to my sets on Flickr’s mobile viewer. I do notice the Flickr app for iPhone/iPod is a nice interface, but of course there are other phones. I was more wondering whether there was consensus out there on the ultimate method to host & manage painting images without the artist being reliant on external webmasters. Flickr so far seems to serve my needs – I like it because the instant I upload a painting and designate it to a set, it’s visible on my site and automatically piped to my Facebook page. But there seem to be a range of different solutions in use by other artists. Hello everyone, love your work! I’ve recently decided to redo my website and find new hosting. The choices are overwhelming. Currently I’m on Artspan. It’s OK but I think Ican do better for less money. Less money is a bonus not a decisive factor. Last year I spent about $6000 on supplies, classes and framing, very little was budgeted towards marketing. Going into 2011 that will change. I plan to use Bluehost as it was recommended for compatibility with WordPress files. I also intend to start making it a practice to both paint everyday and blog everyday. So there’s my two cents on the subject. I’m fairly convinced that for many artists the weak link in their career is marketing, so for myself I will from now on consider it as important as production. Andy, This blog itself is written using WordPress with hosting by BlueHost. It’s really affordable and I’ve been pleased. WordPress isn’t perfect, but I believe it’s just about the best on the market, and it’s free! I found your article valuable and I’m going to tweak my website based on your input. 1. How important are dates in a bio? 2. Is publishing an address, my studio is in my home, essential? 3. What about a page of registries and links that are art related? I’m pleased to hear my decision on both WordPress and Bluehost to be confirmed not once but twice. I feel even more confident now that I’ve made a great choice. I cannot begin to describe how excited I am about the future, it seems all my dreams are true. I found a wonderful, truely awesome women, that is fantasicly creative, a dear old friend contacted me on facebook, my art is taking a new more powerful direction, the Universe is working overtime to bless me with all I need and more. Can’t wait to start blogging. That’s great, Andy – sounds like the stars have aligned. Best of luck with the new website! Thank you very much for this info. Its good to know Ive done most of these things. Ive had my website a year or so. I love the blog area Its fantastic as a portfolio, but I havent any sales yet, so I don’t know where I’m going wrong. I twitter facebook etc as well. Hi Jenny, thanks for reading. Artists websites are incredibly important, and John and I will be doing an interview soon on how they can be improved even more. Having an online presence is only part of a strategy – getting into exhibitions, doing retail shows, personal interaction are all part of balancing the marketing and promotion of your career. Thank you for sharing all this info. I find the business side of being an artist very interesting and can be just as creative as making the work. Ive spent many years trying different things and look forward to learning some new strategies in this area to try. I am a fellow artists and I just want to say be patient and sales will come. I have a web site and facebook, but most of my sales come from open studios ans exhibitions. I don’t do twitter or a blog. There is only so much time and I want to spend most of it in my studio. Good luck check out my site and facebook. Thanks for the encouragement gay tracy.